He did it. He really did it. He fired Comey. 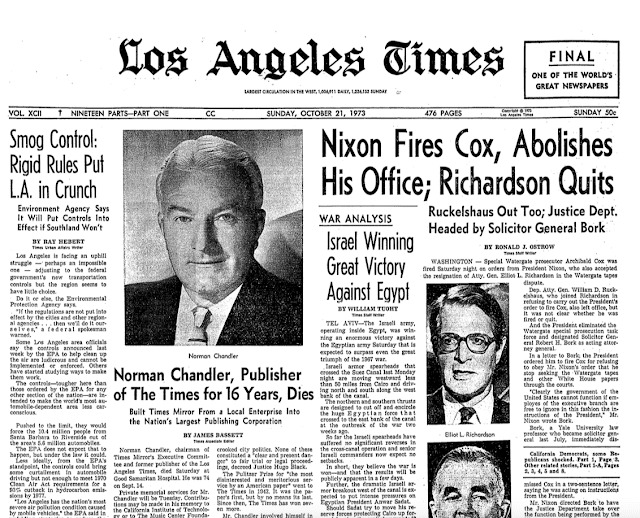 Back in 1972, Nervous Nixon wanted his investigators to be fired. His AG refused. So he asked the AG for his resignation. His next AG refused. Another resignation. His third AG of the evening, Robert Bork, complied. That event is now known as the "Saturday Night Massacre"
Why was Comey fired? Trump claims he was fired for mishandling information on Hillary Clinton's emails which led to her losing the election in November. We all knew that at the end of October -- wouldn't that have made much more sense to do 6 months ago instead of thanking him for the victory? Obviously that's another of the many #TrumpLies. In this case, Occam's Razor applies: Comey was fired because he uncovered evidence of #TrumpRussia. Just as Yates and Bharara were canned for pointing out evidence of treason within the Trump Administration, Comey too was shown the exit. There's no coincidence this occurred a day after we learned that a Grand Jury has subpoenaed #TrumpRussia documents. Of course we have hard evidence that Trump and Pence were at the very least complicit in placing a Russian Agent (Moscow Misha) in a position with access to the most classified information available to the White House. And it appears that there is evidence that takes it beyond complicity. But even the complicity is grounds for the impeachment of both Trump and Pence. In 2019, when the Democratic Congress has its first vote after confirming Speaker Pelosi, that vote needs to be an impeachment vote for Trump followed by an impeachment vote for Pence. Then the Democratic Senate can toss out both of them. This charade has gone on too long. Trump should not be allowed to follow Nixon and resign before the truth comes out. His future belongs in a jumpsuit the same color as his orange skin.